This graphic depicts the passage of asteroid 2014 EC past Earth on March 6, 2014. The asteroid's closest approach is a distance equivalent to about one-sixth of the distance between Earth and the moon. The indicated times are in Universal Time. 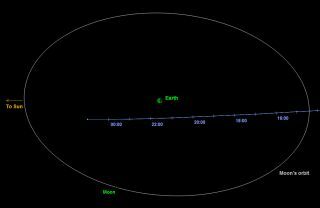 A tiny space rock barely missed Earth today (March 6) in the third of back-to-back-to-back asteroid flybys over the past 24 hours, coming six times closer than the orbit of the moon. The 25-foot-wide (8 meters) asteroid 2014 EC came within 38,300 miles (61,600 kilometers) of our planet at 4:21 p.m. ET (2121 GMT) today, NASA officials said. For comparison, the moon orbits Earth at an average distance of 239,000 miles (385,000 km). But today's close encounter was special in one sense — it came just one day after two other space-rock flybys. On Wednesday afternoon (March 5), the 100-foot-wide (30 m) asteroid 2014 DX110 zipped within 217,000 miles (350,000 km) of Earth. "A third asteroid, 2014 EF, which is closer in size to today's 2014 EC, passed Earth at about 7 p.m. PST (10 p.m. EST) Wednesday, with closest approach about twice as far from Earth as 2014 EC's closest approach," NASA officials wrote in an update today. Several of the asteroids that have been spotted passing with the orbits of the moon and even Earth's communications satellites. See how the asteroid flybys compare to each other in this Space.com infographic. There was never any danger of an impact by the asteroids during these flybys, researchers said. The odds that 2014 EC will ever hit Earth are currently estimated to be 1 in 2.7 million. The Russian meteor got worldwide attention, alerting the public and policymakers to the very real dangers posed by asteroid strikes, scientists say. Many researchers are pushing for more money and new instruments to aid the hunt for near-Earth asteroids; just 10,660 have been detected to date, out of a total population thought to number in the millions.